after using avast "free" for over a long time is started to notice that the webshield/siteblocking is not working all of the time. 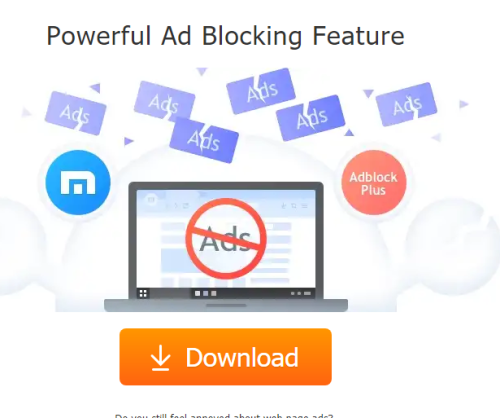 on sites where i blocked "add domains" so the site is addfree, it worked for a long time with the browser i use: "maxthon"
but now the siteblocking feature is not blocking those domains anymore. if i use edge for example, the webshield/siteblocking is working properly like it should and there are no adds served/ the banners show a avast user inbut block message. i have done multiple checks with both avast and malwarebytes and awdcleaner, a few days ago and they gave no results of any malware or virussus or adware. 4- Other security related software installed..? 5- Which AV(s) did you use before Avast..? 1 i use avast "FREE"
due the site not having the addware on their site during that period. i have updated to the latest version and virus definitions, but still the sites are still creating popups. there is only 1 more thing i can try and that is to clean the web-filter list and rebuild it anew. "i have updated to the latest version and virus definitions, but still the sites are still creating popups." the cobalten "addware" is not installed on my pc the site uses it as a means of add revenue. or another Ad blocker Or, use the Avast Secure Browser which has ad blocker built in. sadly there is no ublock origin extension for the browser i use. nor are there any other addblock extensions available. as i said before it used to work like normal, but now it is not working anymore. even add-domains are not being blocked anymore. the other popup-domain is being blocked, but i dont understand why the cobalten domain is not being blocked. What is obvious is that Avast WebShield is working properly. It is blocking as it should, thus creating the popups. You report maxthon does not support uBlock Origin. Using uBlock will help block but you've to use another browser. Simplest workaround would be to follow bob3160's advice, and perhaps find another adblocker if you want to use maxthon. I would still suggest giving the Avast Secure Browser a try. but some sites also use "anti-adblock" meaning you cannot access the site till you disable adblocker.